The 13th PAOC was held at the Corridor Springs hotel in Arusha. 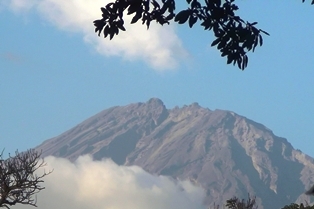 On clear days the peak of Mount Meru (below left) could be seen from the hotel, as could a variety of birds including Brown-breasted Barbets and Palm-nut Vultures (below right). 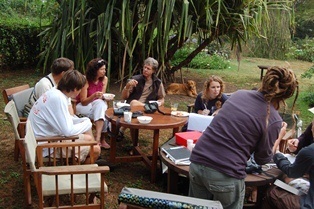 Most of the Animal Demography Unit (ADU) delegates stayed at the Meru House Inn, conveniently situated near a Baglafecht Weaver colony. Also, nearby were good restuarants (Indian and Chinese) that we visited in the evenings. The conference started on Monday 15 Oct and after the plenaries and talks, a Round Table Discussion on Afring was held. AEWA, African-Eurasian Migratory Waterbirds Agreement, is hoping to raise some funds for AFRING, which bodes well for bird ringing in Africa. 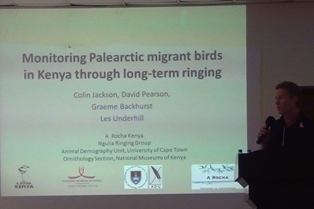 During the week-long conference there were many orals and posters relating to ringing. For instance, orals presented by Colin Jackson (below left) and Neil Baker (below right). MSc student Marc Burman from the ADU was awarded a prize for his poster on moult of Barn Swallows - see poster here. 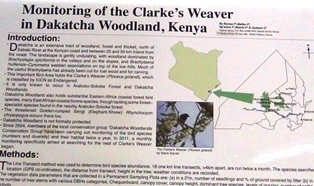 "Monitoring of the Clarke's Weaver in Dakatcha Woodland, Kenya" by F Barasa et al. (below left). 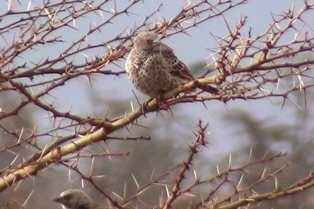 "The effects of forest land use types and fragmentation on two-globally threatened bird species on the Obudu Plateau, southeastern Nigeria", by FD Dami (Bannerman's Weaver and White-throated Mountain Babbler). 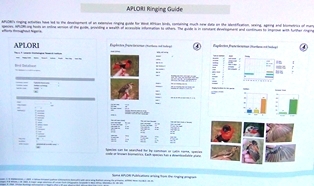 "APLORI Ringing Scheme" (below right) - see searchable database. 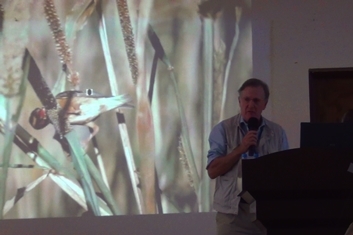 Robert Thomson - Weaver nests as a resource to other species: the case of sociable weavers in the Kalahari. Adrian Craig - Nectar feeding by weavers (Ploceidae) and their role as pollinators. P. melanocephalus, P. baglafecht and P. aurantius probably need to be split. 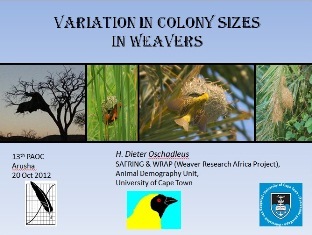 (**) My talk included some general results from PHOWN (PHOtos of Weaver Nests), so thanks to all PHOWN participants! 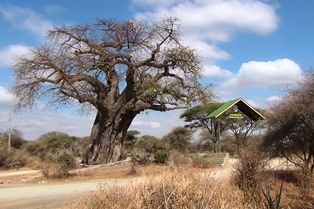 Delegates could choose one of three venues to visit, and I went to Tarangire NP. 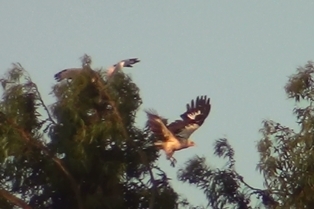 There was much birdlife as well as wildlife. 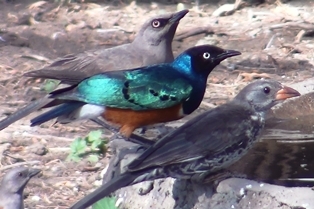 The entrance (below left) has a bird bath that attracted a variety of birds, as shown here - Ashy Starling, Superb Starling, and female Red-billed Buffalo-Weaver (below right). 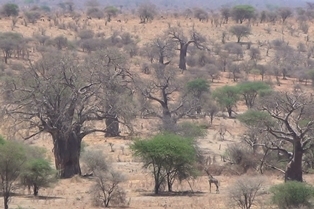 Wildlife included lion (resting in the shade of a tree), giraffe (below left), close-up views of elephant (below right) and much more. Weavers I had hoped to see included Rufous-tailed Weaver (below left), Speckle-fronted Weaver and White-headed Buffalo-Weaver (below right). Unfortunately weavers were not breeding yet in general, as they were waiting for the imminent rains. 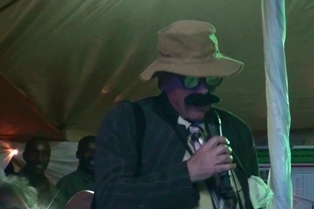 On Saturday evening a great gala dinner was held with a local theatre piece and the usual visit by Prof Lump-Splitter (Tim Dodman) to keep us entertained (below left). 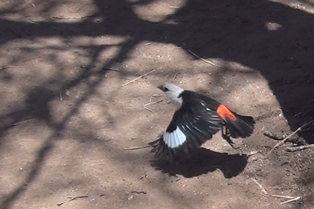 On Sunday morning the ADU contingent had a free day before returning home and we went ringing on the property of safari tour guide, Daudi Peterson. 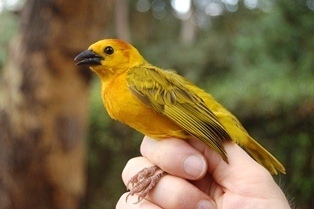 The most caught species was Red-billed Firefinch, with a variety of other species, and a handful of male Taveta Golden Weavers (below right). The conference organisers did a superb job! 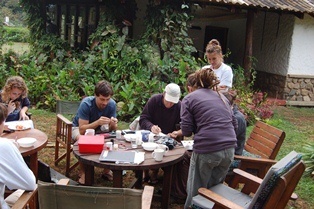 Many people helped organise the bird ringing session. Thanks to Colin Beale (University of York) for organising the event! 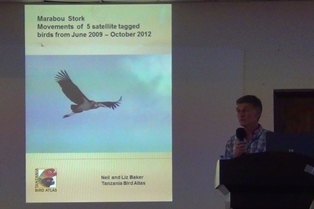 Neil and Marc Baker (Tanzania Bird Atlas) provided rings, poles and other equipment. Colin Jackson and Andrew Kinzer (Arocha Kenya) brought mist nets and other equipment. 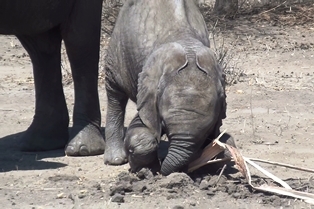 Daudi and Trude Peterson (Dorobo Safaris) provided a wonderful venue and fantastic hospitality! Read more about the PAOC.